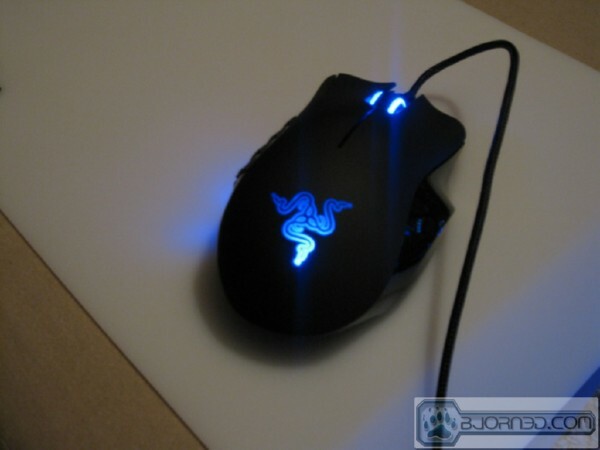 Razor has introduced the worlds first MMOG specific mouse, the Razer Naga and what did we find bundled with our Naga the Razer Megasoma Mouse Pad, Gaming anyone? Razer has always been one of our favorite gaming companies and when they came up with the Razer Naga mouse and Megasome mouse pad we knew we had to have hands on and give them a run for their money. To that end we forced ourselves to play endless hours of stand alone games and several marathon online MMOG gaming sessions to test the Naga and Megasoma combination. 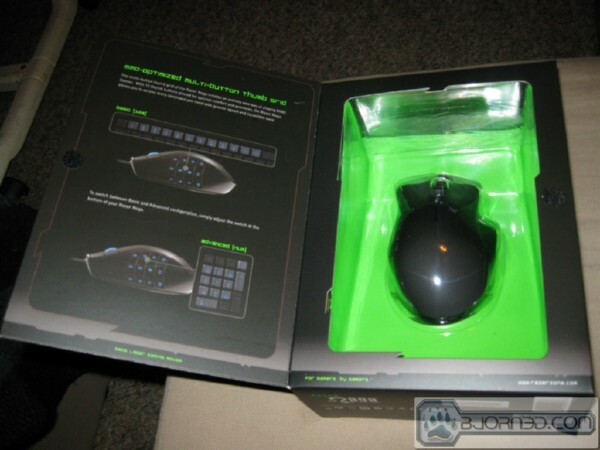 With a 12 thumb button grid handy for online MMOG gaming the Naga is sure to be a force in online gaming as soon as people find out how much easier it is to thumb the keys than stab at the keyboard to use the all important 1 – 12 keys on the keyboard. No longer do you have to make that frantic dive for the keyboard, you can simply thumb a button and use whatever function you have bound to the key, or use one of Razer’s preset profiles available for download on the Razer Webby. 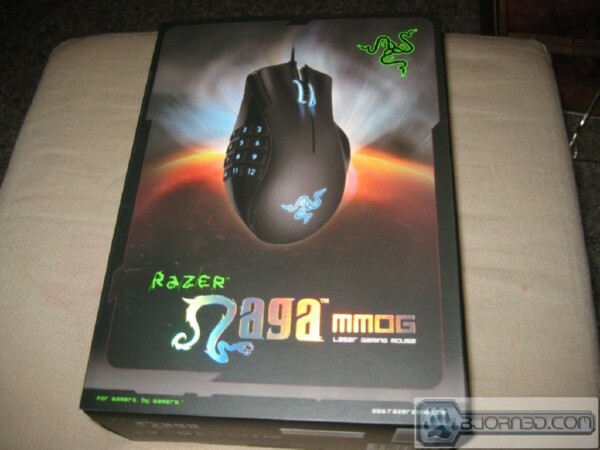 With typical Razer styling the Naga promises to revolutionize MMOG gaming and take it to a new level. The Thumb-pad also doubles as a numeric keypad if you happen to be a bookkeeper with a bionic thumb and the Naga Functions well in standalone games but functionality on the 12 button keypad is limited because Razer hasn’t released a Programmable button utility for stand alone games. So if you want extensive support for stand alone games you will have to map the game commands to 1 – 12 instead of mapping the games commands to the mouse keys. We’ve been in contact with Razer about the lack of programmable keys for stand alone games and here’s what we got directly from them. 1. 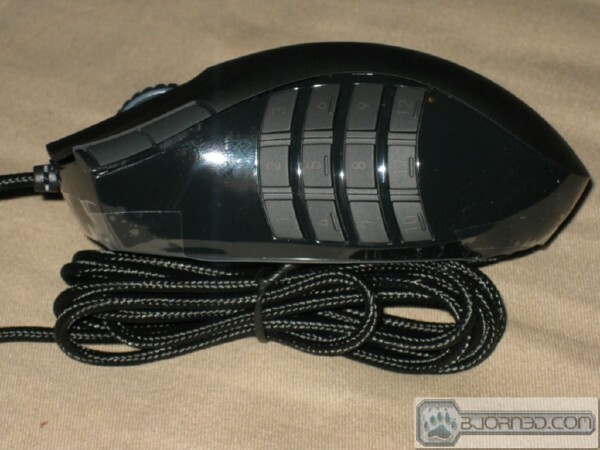 When we first designed the Naga, we were focused on making this the ultimate MMO gaming mouse and we were focused on in-game add-ons as the primary mode of remapping keys, creating macros etc so that we would not run afoul of the terms of service and the game experience that the developers wanted to create for the gamers. 2. Software driver remapping of keys is a standard function for most of Razer products and we do have suitable solutions that we intend to release in the near future but we are working closely with the MMO developers to ensure that any such release will not detract from the game experience of MMOs. We appreciate Razer listening to us and the gaming community and adding support for programmable keys in the near future and their promise of adding extended functionality based on our, and end user, feedback just shows you how much Razer really cares about the gaming community. To Razer specifically, Sorry we were such a persistent pain when it came to programmable buttons for the Naga but we really want to PWN in stand alone games too! 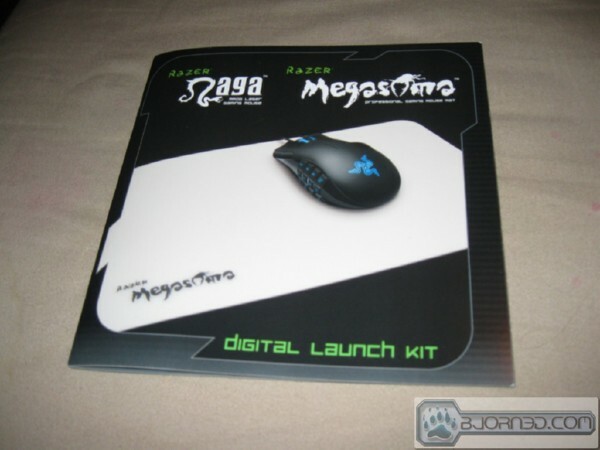 Included with our press kit was the Megasoma Mouse pad so we are bundling the Megasoma review with the Naga review. You should take note though that the Megasome mouse pad is not bundled with the Naga for retail purchase and the Megasome must be purchased separately. 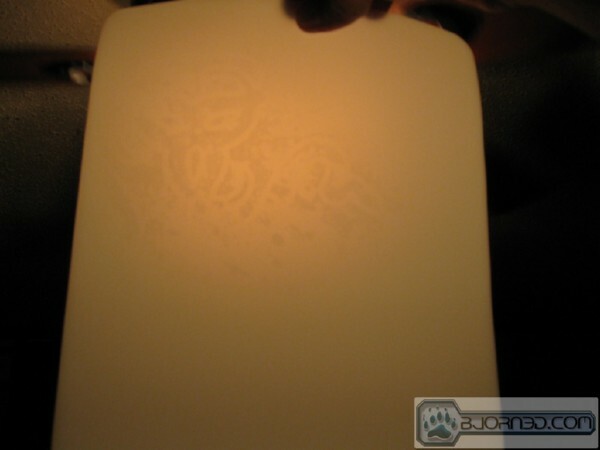 The Megasoma is a white silicone like high end mouse pad with the unique feature that it has an embedded glow in the dark pattern in it. Like most of the Razer products we have high expectations for the Megasome. We’ve seen at least one product from Razer that wasn’t black, a set of high end gaming ear-buds but when a Razer Product isn’t black it’s a shock to us. The Megasoma’s white silicon like shade makes a nice contrast to the Naga and even more so when your gaming with the ambient lighting in the room muted. With up to 5600DPI and adjustments for that in the included Razer Naga configuration software your sure to find a DPI setting that you like. We would have liked to see DPI on the fly with button push functionality. Dropping back to Windows to adjust DPI breaks the rhythm of the game. The 1000Hz ultra polling ensures that the Naga will respond instantly to your guidance and the 200 inch per second travel rate ensures that you will never outrun the mouse pointer by moving the mouse to fast. The Ultra slick Teflon feet lets the Naga slide across your mouse pad with almost feather like ease. The Naga utilizes a horse shoe style foot rather than little pads so the longevity of the Teflon feet should be great. 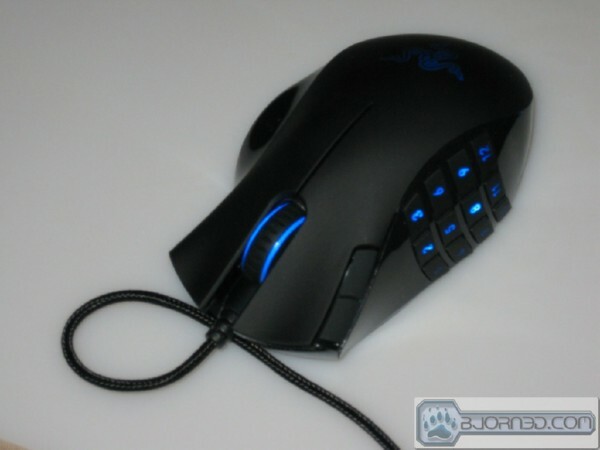 The 17 MMO optimized buttons make the Naga a killer option for MMOG gaming and the 1 – 12 keys on the thumb pad which send the numbers 1 -12 are what most MMOG games use but we consider the upcoming (promised) programmable button interface to be vital for games that are standalone or don’t use the standard 1 -12 keys for MMOG gaming. Some might consider this a little harsh but we’ve polled visitors to the site and checked end user feedback and most of the end users want a utility to map the mouse keys so it’s not out of line to expect mappable keys. 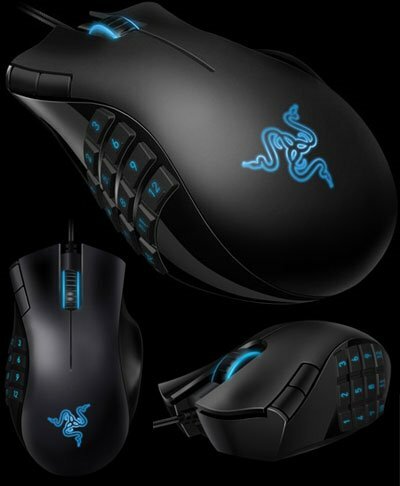 So far Razer has two AddOns for the Naga and those are World Of Warcraft, and Warhammer but we’ve been told more profiles are on the way. Profiles must be manually added to the MMOG games and we really feel that the mouse or mouse software should be able to auto-load the profile for you. 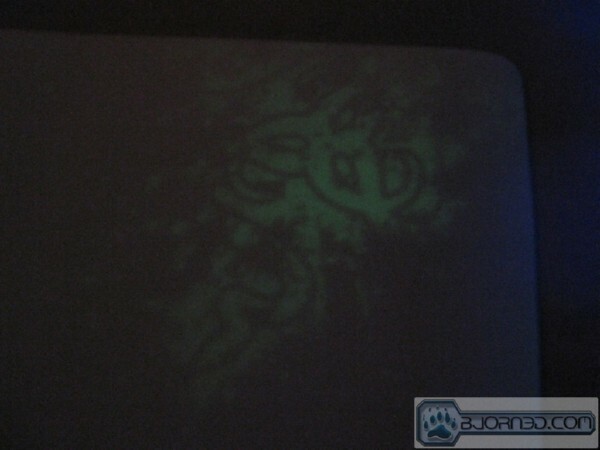 We’ll get to the Ambient glow a little later on and as you can see from the specifications on the Megasoma it is a Silicone mouse pad. It’s just a personal preference but we like certain things about silicon pads and dislike others. We like that the pad is easy to clean and silicon is very durable. By the same token Silicon pads can make an annoying noise when a mouse runs across them and your skin can scrape across them if you rest your arm while mousing. The Megasoma suffers from both these common Silicon pad shortcomings. While running the Naga across it we noticed it makes an annoying swish sound that is loud enough to be hear during normal gaming. If you put to much pressure on the Megasoma with your arm resting on any portion of it your skin may stick to the pad and delay swift in game movement. 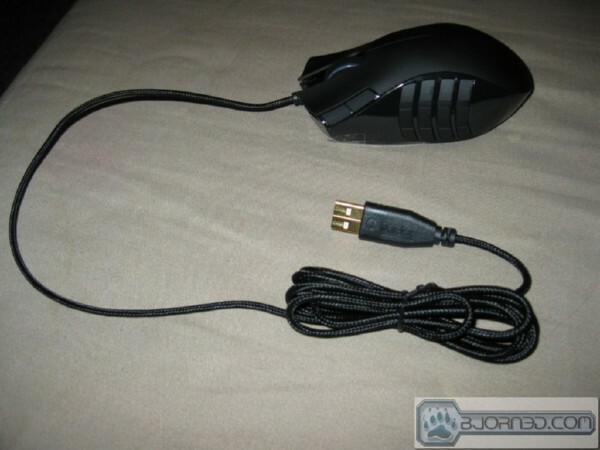 This limits good mouse operation on the pad to the edge of the pad or hovering your arm over it. Ever gamed for 5 or 6 hours straight? Hovering your arm really isn’t a viable option. 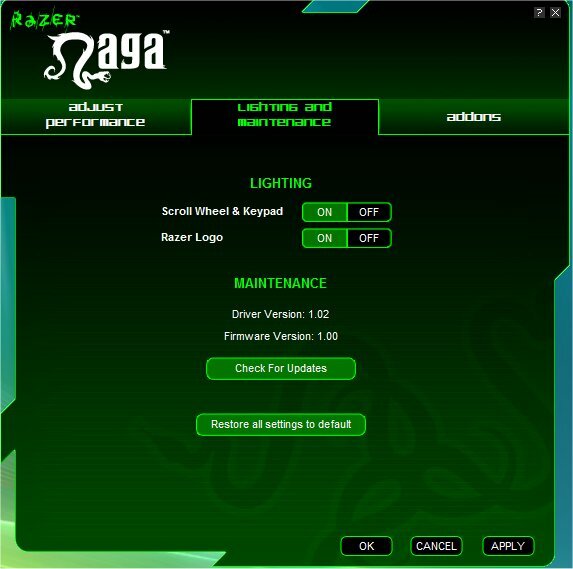 The Naga software is a lot simpler than most of the Razer software we’ve seen. Most Razer software has options to program the buttons on the mouse and since that’s not available yet we just have a couple of screen shots of the software for you. The Naga software interface is simple and clean and we hate to keep harping on it but noticeably missing is the ability to program the mouse buttons. What you will find is the ability to change the polling rate, and DPI, you can also enable independent X-Y sensitivity. The second screen lets you turn on and off the lighting on the Naga and check for software updates. You can also reset to the default settings. The last tab on the software takes you to a DL page where you can find the two AddOn’s for Naga supported online games. We located and linked several Utubes of the Naga, this one is the Naga Introduction Video so get some popcorn and fire it up if you like. 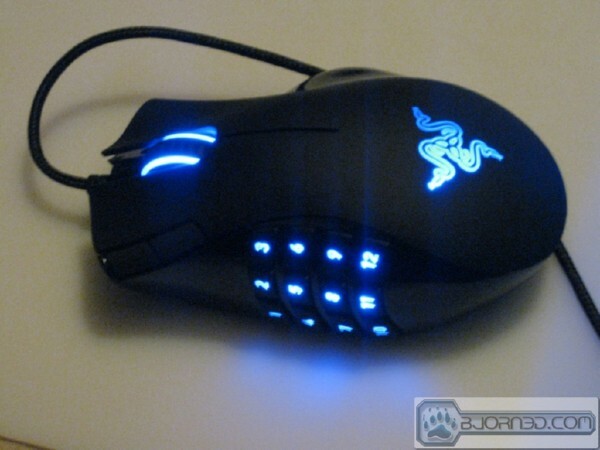 Razer Naga™ MMOG Gaming Mouse key binding and add ons in-game configuration. This Video explains how to use the AddOn’s for the Naga supported online games. We hope that you find these videos helpful and informative and if you like videos in reviews please feel free to let us know in the forums. We mentioned earlier that we didn’t receive a retail kit so we thought you we’d show you how lucky we really are. 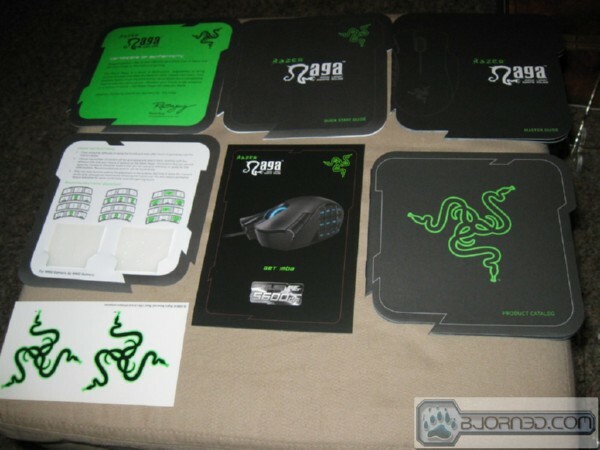 In our Media kit we got a Megasome Silicon Mouse Pad, Razer Naga, and a carrying case for LAN parties. Please note you will have to purchase the Megasome and Naga separately, and we don’t think Razer sells those, so if you want one let Razer know and maybe you’ll see one available on their site soon. 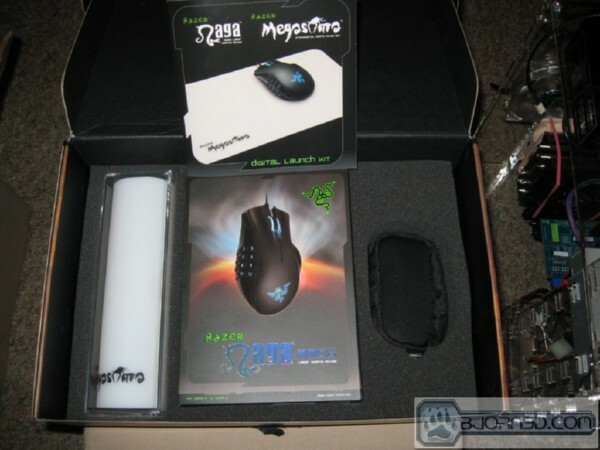 The Naga box is quite attractive and makes no bones about being a MMOG mouse. The mouse itself looks as good in person as it does on the box which is unusual. Opening the retail box you get the standard clam shell packaging and it protects the product very well. You won’t find this in the retail box but we got a little extra in our kit. You get the usual Quick Start Guide, Certificate of Authenticity, Manual, Razer case badges, and you get a key training kit to help smooth the learning curve on the 12 key panel under your thumb. Razer has been doing braided cords with their high end mice and that’s a nice touch because they don’t tangle or kink as bad with a braided nylon covering. 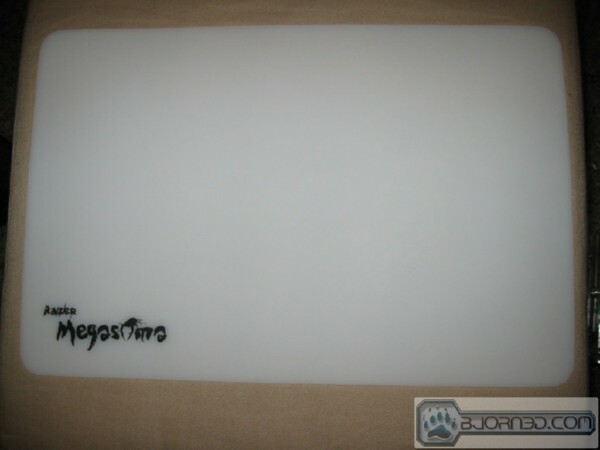 On the side of the Naga you find the 12 key pad especially designed for MMOG games. You also find a forward and back button on the top left. That’s 14 buttons on one side alone, then the two normal mouse buttons and scroll wheel totaling 17 buttons on the Naga. Up close and personal with the Naga you’ll notice that the top two buttons are a panel design that we really like, since the buttons are incorporated into the shell the slightest pressure anywhere along the front of the shell triggers the click. The Forward and Back buttons are handy to your index finger but can be thumbed if desired. Looking head on at the Naga you notice the ledge on the left of the mouse and we found our ring finger resting on the ledge comfortably and our little finger helping grip the mouse during intensive game play. Though the Naga is somewhat small for monster sized hands it was a comfortable fit for most of the people that gave it a trial spin. The Ledge allows your hand to cup the mouse in a natural manner and prevents your hand from just hanging over the edge. Just for general information the primary reviewer is 6’4″ and has monster hands so if you have small hands your grip will be somewhat different than this. We were expecting to find at least a DPI selector switch on the bottom of the Naga but all we found was the 3.5g laser and a 123/Num switch. The 123 is for MMOG gaming and the Num turns the pad into a semi-functional 10 key keypad. We say semi-functional because most 10 key keypads have 17 keys by themselves so 12 keys can’t cover all the functionality of a 10 key keypad. Hooked up and running the Naga has nice blue LED lighting to accentuate it. We tried about 40 pictures with the LEDs lit up and all of the efforts resulted in blue rays shooting off the mouse but we wanted you to get an idea of what the mouse looks like lighted so after the second set of camera batteries this was the best we could come up with. Then finally the Naga setting on the Megasome Silicon Pad. The White of the pad is a nice contrast for the Naga. 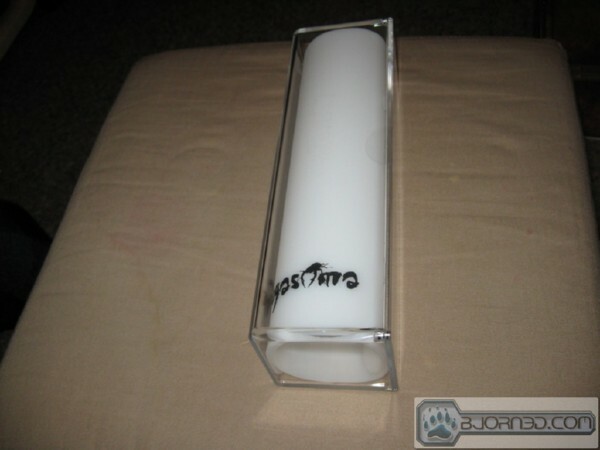 Our Megasoma came in a square plastic tube, we don’t think this is final retail packaging for the Megasoma. 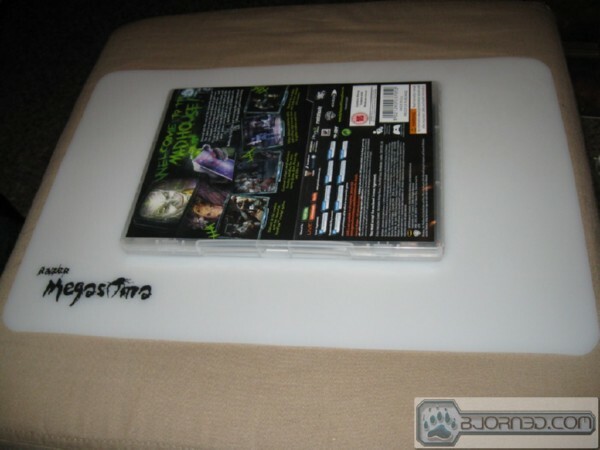 We slapped a standard size game case on top the Megasoma so you could get an idea of the size. 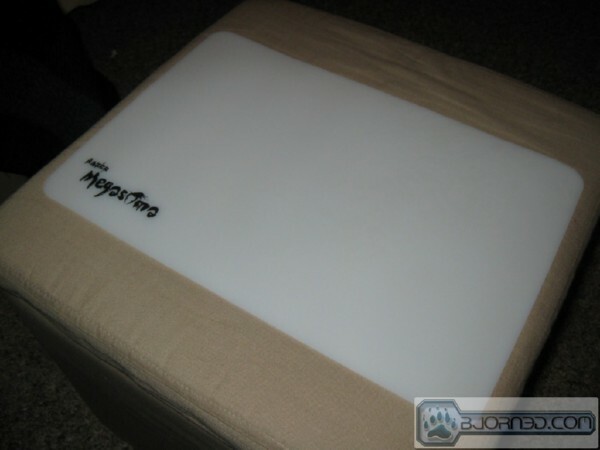 Being a white silicone mouse pad the Megasoma will clean easily but running the Naga across the Megasoma is reminiscent of a loud plastic zipper being unzipped with to much force. The Megasoma makes a good visual impression but we had a hard time getting past the traveling noise made by several mice we tried on it. By design the Megasoma has minute pits in the surface for traction on ball mice and better tracking on optical and laser mice and those act like the grooves on a vinyl record. Take an old fashioned vinyl record and drag your fingernail across the grooves and you get noise. Same principal here dragging the mice across the pad makes an annoying noise. Having spent endless time, effort and money making the test rig entirely silent having a noisy mouse pad doesn’t work for us. Operational speaking the Megasoma worked great, tracking was right on, movement of the mouse was smooth, and it helped prevent overshooting the target, we were fine with it until someone in the lab motioned for us to take the headphones off and pointed out the noise. We took a flashlight laying around the lab and put the LED light on the Megasome for about a minute then switched off the light and the glow in the dark pattern emerged. It’s kinda cool but since it’s photo-reactive and low light conditions are required we don’t know how much mileage you’d get from it. We know we’ll catch flak for saying this but how about putting a second layer on with something like non-slip rubber, hanging a USB cord off the pad and lighting it with mini LED’s? At least during normal operation you would be able to see the embedded pattern. Here we are holding the Megasoma up to the light to charge the photo-reactive material and you can see just how muted the pattern is. We’d have to say the Megasoma was a close miss for us, we like the accuracy, tracking, and wash-ability of the Megasoma, but the noise from moving the Naga and several other mice across it negates most of that. If you can live with the “Zeeeeeeeee” noise the mouse makes scraping the surface go for it. As the surface wears the noise might diminish we can’t say at this point. There’s really only one way to test a MMOG mouse and that’s fire up your favorite MMOG games and try it out. We chose WoW and Warhammer to test with, but any MMOG with 1 – 12 for the main toolbar would have worked as well. Rather than run with a blow by blow testing results section lets deviate from the norm and go off grid with the Naga. 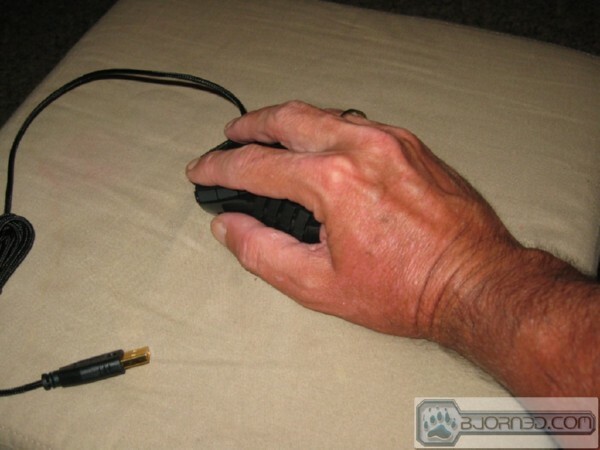 We played WoW and Warhammer with the Razer provided AddOn’s and both the games were much easier to play once we got past the 12 – 14 hour learning curve on the Naga. Razer says that you can expect a decent learning curve period and includes a training kit with the Naga. Once we got past the learning curve the 12 button keypad was indispensable and we found ourselves resorting to the numbers on the keyboard much less. Once in a while panic would take over and we’d stab for the keyboard out of habit but we expect that to diminish as time goes on. 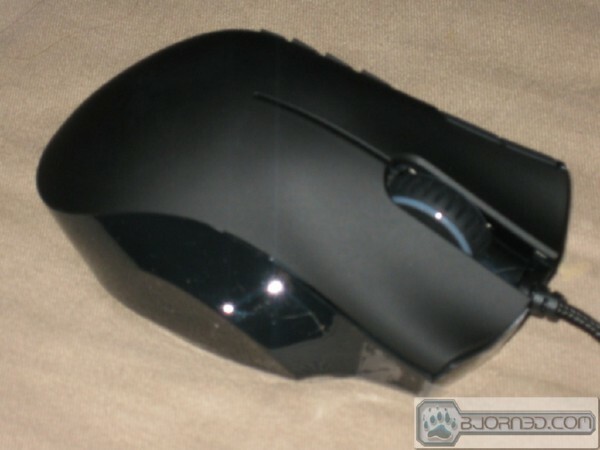 Precision on the Naga Mouse/Megasoma pad was phenomenal and the mouse tracked and responded very well to our guidance. 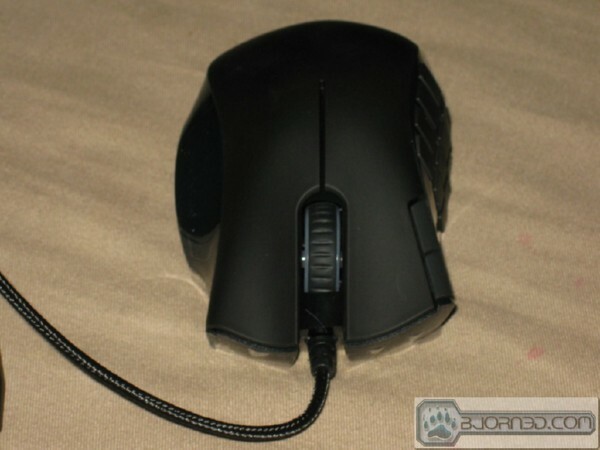 The lack of an on the fly DPI switching button was a handicap because we are used to the Lachesis and use the DPI button frequently. The Megasoma is back in it’s case because of the annoying noise it makes when the mouse is moving across it. While it helps precision the little extra precision isn’t worth the swishing noise it generates. We’d have to call the Megasoma a close miss for us. Maybe the ridges on the Megasoma will wear down over time if you use it enough but two weeks later it was still swishing so like we mentioned it’s back in the box. 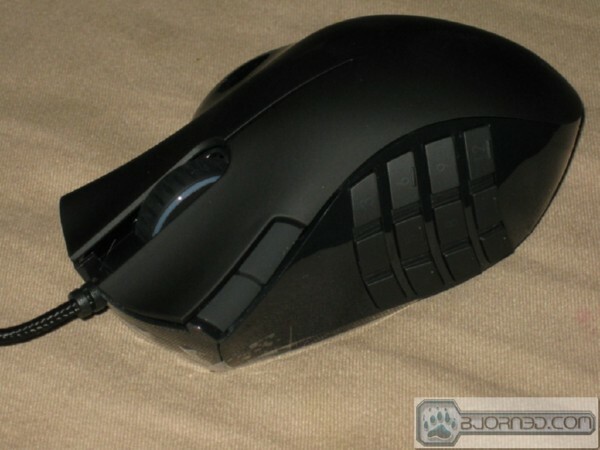 The Naga is great for MMOG games that use the 1 – 12 numeric system for the toolbar, we however know of several games that are MMOG and don’t use the 1 – 12 numeric system and the Naga did well as a 2 button/Scroll wheel mouse but lacked proper functionality for what you would expect from a mouse that is considered high end. Keep in mind it was only lacking that functionality in games that didn’t support the 1 – 12 numeric system. 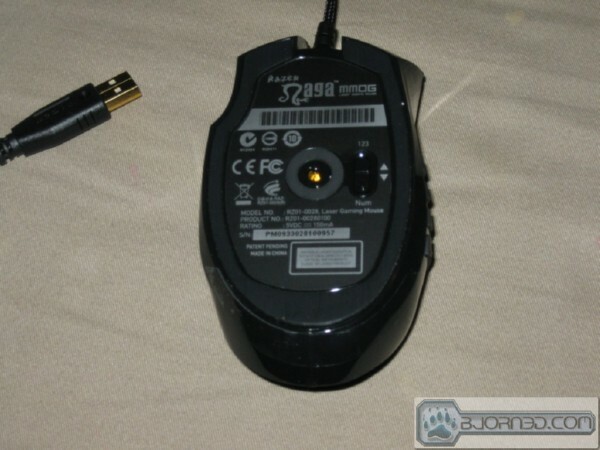 For games that do support the 1 – 12 numeric system the Naga was without a doubt the best MMOG mouse we’ve seen. We’re not going to harp on it but the Naga needs the promised programmable key utility to let you change the signal the keys send. The lack of programmable keys is a glaring oversight. Since Razer has promised they are working on a programmable key utility and is working closely with MMOG developers to make sure it doesn’t interfere with MMOGs (and we don’t see why it should if they include a profile to default the 12 keys to 1 – 12) we aren’t going to give the Naga a rating at this time because we don’t consider it a finished product. When the 12 key utility for programming the keypad is available we’ll revisit and rate the Naga. If we had to rate it at this time we’d say 7 out of 10 mostly due to the lack of programmable keys. 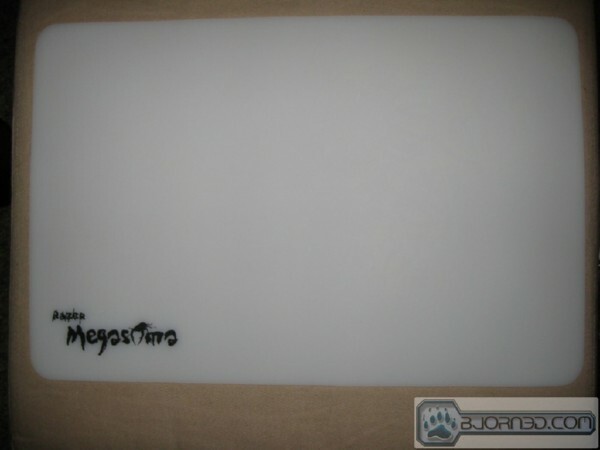 We like the tracking and precision the Megasoma affords, we also like the glow in the dark logo on the Megasoma. It’s a silicon mouse pad and those clean easily but in this case the Megasoma produced a grating Swish noise when we tried 3 different mice on it. The Naga has horse shoe type Teflon feet and that type footing system was the loudest. We also tried two mice that have peg type Teflon feet and those weren’t as loud but it was still irritating. Having spent copious time and money ensuring the test rigs are completely silent using a noisy silicon mouse pad isn’t an option for us and we expect that most people would find the swish/zippppp noise the Megasoma made with the 3 mice we tested would find it annoying. We are using an addition to our scoring system to provide additional feedback beyond a flat score. Please note that the final score isn’t an aggregate average of the rating system. Summary: The Razer Megasoma is a good mouse pad but it’s way too noisy for us so we’re calling it a close miss. If you can put up with the noise from the Megasome it’s a good pad, it’s just not good for us and people listening to it from a distance of 2 foot were annoyed by the noise. Super gluing the Megasome to your buddies desk might be funny unless you happen to room with him. Beyond that it’s probably staying in the original box.